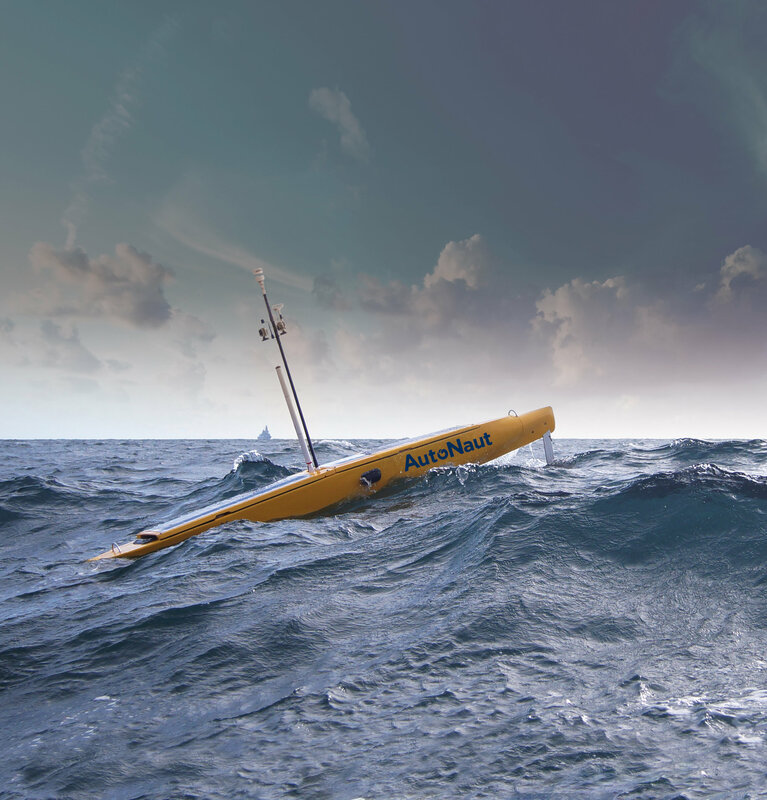 A new company from ESA's UK business incubator has developed an autonomous boat that is propelled by the waves and carries ocean sensors powered by solar energy. Advances in ocean monitoring are improving our understanding of the seas and environment, including marine life, sea temperatures, pollution and weather. However, fuel, maintenance and manpower for research ships are costly, and sea conditions restrict where measurements can be made. The autonomous AutoNaut boat is propelled by the waves and carries ocean sensors powered by solar energy. The AutoNaut start-up from ESA's Business Incubation Centre in Harwell has come up with a revolutionary automated surface vessel to collect data for long periods at a fraction of the cost. The vessel is propelled by a unique wave foil that harvests energy from the natural pitching and rolling at sea. Speeds of 2–5.5 km/h are maintained under most sea conditions. It is one of the world's first small commercial applications of wave propulsion and it can operate at sea for many weeks at a time, covering hundreds of kilometres in a week in areas and conditions too hazardous for humans. 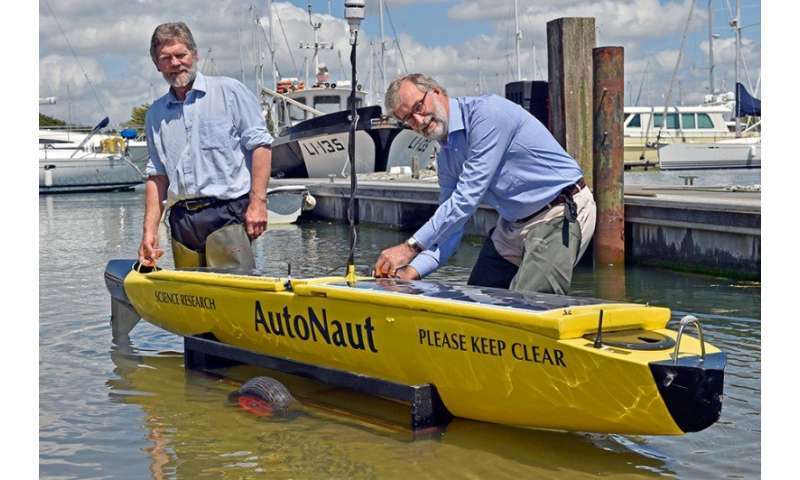 A new company from ESA Business Incubation Centre Harwell in UK has developed the autonomous AutoNaut boat that is propelled by the waves and carries ocean sensors powered by solar energy. It is so quiet that it can measure the whistles and clicks of dolphins over large areas. Using satellite networks, the AutoNaut receives its instructions from anywhere in the world. It can carry cutting-edge, solar-powered sensors to capture raw measurements, process the data onboard and then send them back to the operators via satellite. "If a satellite radar picks up suspected oil spills, our AutoNaut can verify it on the spot, map the extent and take water measurements for relay back to shore," said Phil Johnson from the company. There are four AutoNaut sizes, ranging from 2 to 7 metres. With increased length comes greater speed and payload capacity, as well as an increase in the power generation capability for the on board sensors. Auxiliary electric propulsion or hybrid drive is available for calm conditions and manoeuvring. A fuel cell may be fitted to provide additional power for sensors, although for most missions the Photo Voltaic panels harvesting solar energy on the deck will be sufficient. The team recently completed its two-year incubation at the ESA centre. There, they used highly specialised satellite navigation and communication systems to refine their navigation and control capabilities, and deliver near-realtime data collected from the sensors.